Just a quick post in between campaigning. 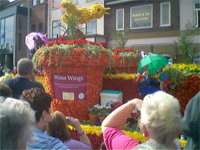 On the weekend I went to the Spalding Flower Parade, which was rather nice. I spent most of the time with William on my shoulders so he could see what was coming around the corner. The main reason for this post is this test, which I had planned to do on Monday.